Swrve Help Center > Resource A/B testing > What is a Swrve resource? In Swrve, a resource is a way to serve content to users that is configurable in the Swrve dashboard. Each resource contains attributes that the Swrve SDK can access and use to customize different aspects of the app. When a user launches the app, the SDK downloads all resources onto the client and stores them in the Swrve Resource Manager. In the app code, you can access the resource’s attributes. 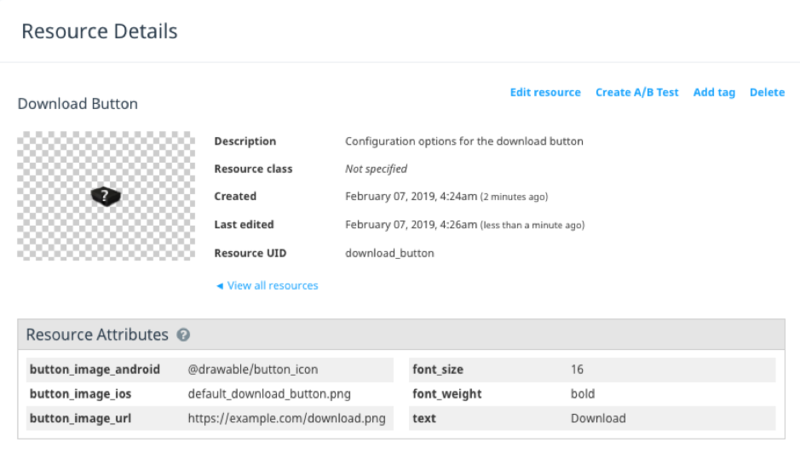 The example below illustrates how to access a Resources attribute and use it in your app. Notice you also provide a default value in case the resource has not yet been downloaded to the device. // Then, wherever you need to use a resource, pull it from SwrveResourceManager. NSString *button_text = [resourceManager getAttributeAsString:@"button_text"
You may register a number of resources or configuration items that are specific to your app, which you can then use as a basis for A/B testing. Limits apply to the total number of resources that you can register for an app. Learn how to create and manage a resource in Swrve. For more information, see Managing resources. Learn how to A/B test your native app content using resources. For more information, see Intro to resource A/B testing and Creating resource A/B tests.